Vetplant > News > News > Surviving in times of drought. How plants do it? 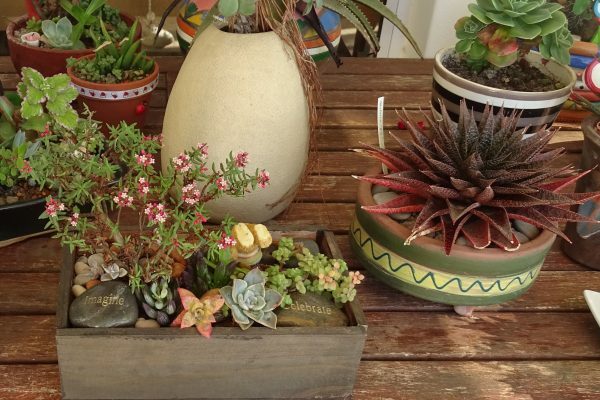 This article appeared in the February 2018 Newsletter of the Johannesburg Succulent Society and are reprinted with their permission. I can imagine that most of us have asked that question when we’ve visited a region that is as dry as anything. Somehow, miraculously, the plants survive. Ok, they don’t grow fast. They don’t produce masses of leaves, or masses of anything, for that matter. But they survive. How do they do it? The way plants lose water is mainly through tiny little “holes” in the epidermis of their leaves called stomata. These holes can be opened on demand, and the reason a plant has them is because carbon dioxide (CO2) has to be let in so that the leaf can photosynthesize, and of course, the oxygen has to be let out. One if the unintended consequences of this is the loss of water through these stomata – not a problem for a plant in a tropical rain forest, but a huge problem for one having to survive in an arid area. 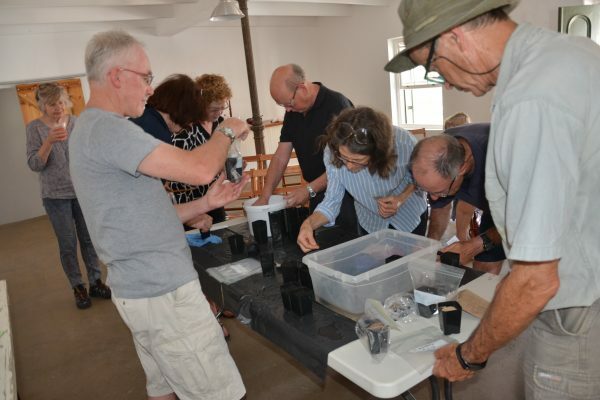 Many of them have developed an ingenious way of preventing water loss. Instead of opening the stomata by day, they open them by night, when it is cooler and less evaporation occurs, and when air humidity is higher. Simple solution, you might say. But the problem is that the CO2 is needed by day, not by night, for photosynthesis, which requires sunlight after all. And here is where the ingenuity of nature becomes apparent: these plants have a kind of “biochemical storage battery”, some sort of “CO2 warehouse” right inside their photosynthetic cells. 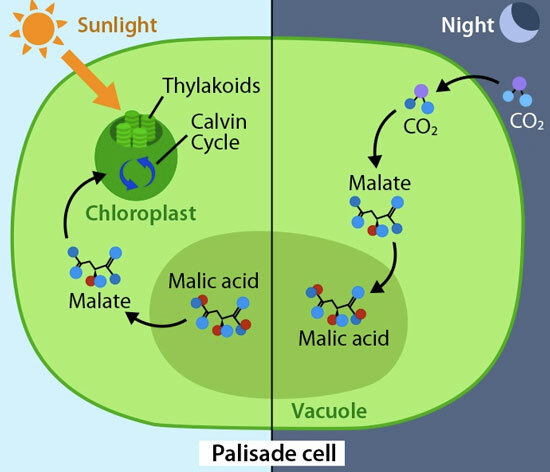 The way this works is simple: the CO2 that enters the leaf at night is “fixed” by an enzyme (called PEP carboxylase) by joining the carbon to a 3-carbon substance, creating a 4-carbon acid known as malate. A specifically formulated “malate shuttle” brings this malate into the “storage tank” – a bag of sorts within the cell called a vacuole. There it sits for the night (stored as malic acid), until such time as the next day arrives, the sun begins to shine, and photosynthesis needs to happen. The plant closes its stomatal pores (no need to lose water in the heat! ), but has no problem undergoing photosynthesis because the carbon is close by. 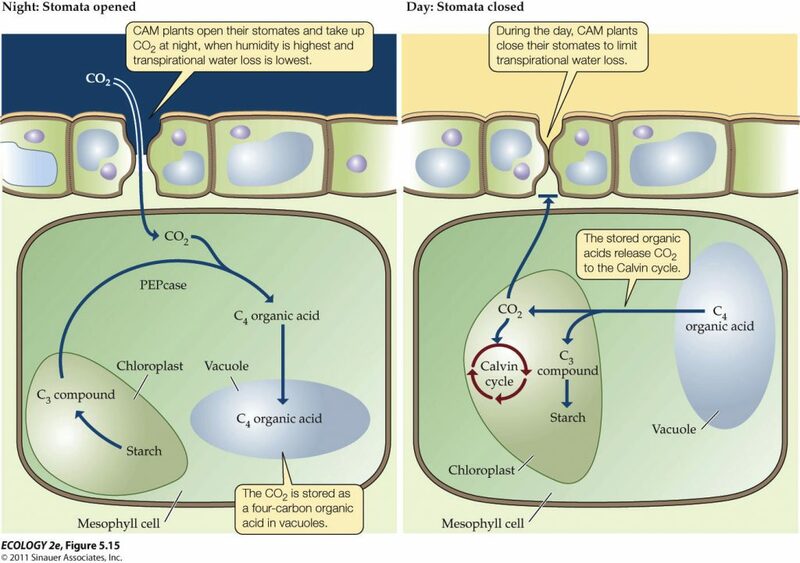 The shuttle brings the malate out of the vacuole “bag” towards the green chloroplasts, the carbon is split off and is fed directly into the photosynthesis chain of events. All of this is incredibly efficient. So it turns out that a “battery” or “storage tank” for carbon is at the heart of these plants’ survival. This is called Crassulacean Acid Metabolism (CAM for short). 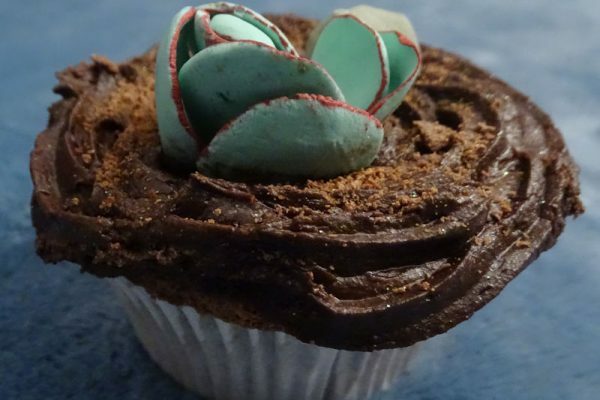 The name is a give-away: this pathway was extensively studied at first in the Crassulaceae, where CAM photosynthesis has been found in almost every species. The “A” in CAM stands for acid – since it is malic acid that constitutes the form of storage. So these plants are sometimes referred to as “CAM-plants”. Because of this accumulation of malic acid (derived from malate ) in the cells at night, the acidity, and indeed the taste, of the leaves changes in the course of 24 hours. In fact, this was dicovered by a certain My Heyne in the early 1800’s, who wrote that he had tasted a certain plant at different times of the day. In the early morning it was “as acid as sorrell”, becoming less so during the course of the morning, until eventually, at noon, it was completely tasteless. Acidification at night, followed by de-acidification by day is the endless pattern, repeated time and time again. One can imagine that this system of photosynthesis is not as efficient as the normal way with the stomata open throughout the day, breathing in CO2 for use at will by the plant. When the supply of stored acid is used up, photosynthesis stops and the plant waits for more favourable conditions under which to open the stomata and begin exchanging gasses again. Growth is somewhat limited by this lack of full day exchange, but the plant remains healthy. It took another 150 years for scientists to unravel the secrets behind this, and indeed, they are not finished yet. It appears that some plants can ONLY use CAM (i.e. they cannot open their stomata by day at all and are obliged to use the vacuole as a storage facility) – they are known as obligate CAM plants. The facultative CAM plants, on the other hand, can do the normal “thing” (opening the stomata by day) or switch to CAM – depending on the availability of water at the time. These plants are found in areas where periods of plentiful water alternate with periods of drought. A large variety of plants have been studied to find out whether they use CAM or not. To date they have found about 16 000 plant species (7% of all known plants) that do so – and the number is likely to rise. It is no surprise that Crassulas, cacti and cactus-like Euphorbias very frequently fall into this category. So do Adenias, as well as Huernias, some succulent Pelargoniums and many Stapeliads. Add to the mix Aloes, Gasterias and Haworthias, as well as the Agaves and Yuccas or the New World, and you have a huge percentage of the drought-resistant plants in the world. Don’t forget Welwitschia mirabilis – that two-leafed curiosity in the Namibian sands. Strangely enough, pineapples do CAM too, as do many tree-hugging epiphytes like orchids and bromeliads. But if the process is so efficient, why do they grow so slowly, you may ask. The answer lies, at least partially, in the fact that it costs the cell a lot of energy to fix the carbon in the form of malate/malic acid in this way. That means that part of the sugars that are produced by photosynthesis are used up to fuel the “carbon storage battery”. Slow assimilation, it seems, it a trade-off for water conservation.